Three NCAA women’s basketball tournament wins. Three NIRA rugby championships. One NCAA Women’s Frozen Four appearance. All after one Title IX case. Quinnipiac University's women's athletic teams have thrived in the aftermath of the case that is now 10 years old. It stemmed from a decision to cut the volleyball and add competitive cheer, an activity a judge later ruled to be not a sport for Title IX accounting. Under federal Title IX provisions, schools must offer equal opportunity for men and women to compete in sports as determined by the gender ratio. In other words, if Quinnipiac women stand at 65 percent of the school's enrollment, then 65 percent of athletic rosters must consist of women athletes. In 2009, the University cut women’s volleyball for a cheer team. However, with the cheer team lacking competition, a federal judge ruled that it could not qualify as a sport. Five volleyball players and the coach at the time, Robin Sparks, refused to back down and filed a federal lawsuit claiming that Quinnipiac had violated provisions of Title IX. The university reinstated the team pending the lawsuit's outcome. This on-going case led to a consent decree, which by definition is an agreement or settlement that resolves a dispute between two parties without admission of guilt or liability. This decree ultimately led to the building of the new soccer, lacrosse and field hockey stadiums at Quinnipiac. Even though the outcome has been positive, female athletes have felt adversity since the case. The women’s volleyball team just fired its two coaches after another losing season. Even women’s rugby has struggled to gain recognition from the university, being forced to play on a field smaller than regulation for the last few years. With these situations to consider, this case has been a driver for success. Because of these leaders in our community, women’s athletics have been responsible for some major growth at Quinnipiac. They have brought the Bobcat faithful new stadiums, national recognition and plenty of winning. 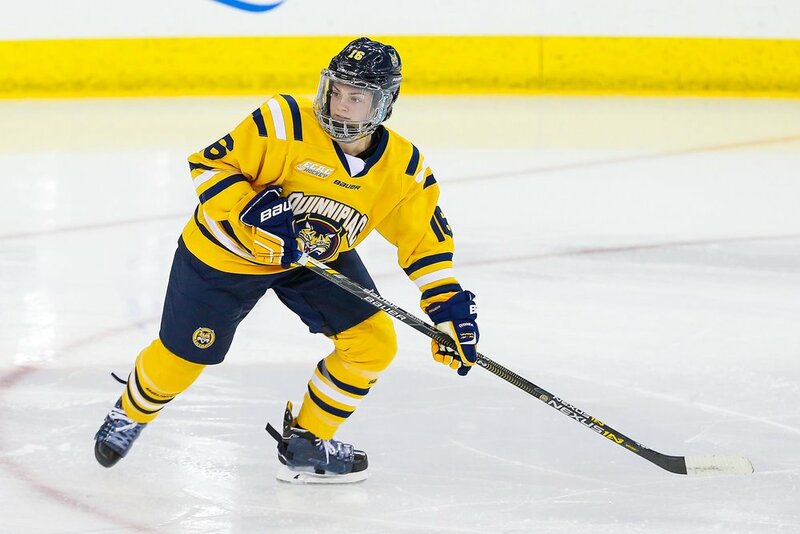 I interviewed three athletes who either attend or attended Quinnipiac to get their perspectives on Title IX, the court case and how the drive of equality continues. John Franklin: In your time at Quinnipiac University, the Title IX lawsuit was a prevalent situation. How do you remember it effecting your career and the athletic department as a whole? Elizabeth Kloos: I did read through all the court documents before my freshman year so I knew what I was headed into, but honestly so many of the lawsuit requirements had been taken care of before I arrived that it wasn’t talked about much. Elizabeth Kloos playing middle hitter during her senior year at Quinnipiac University. We did have meetings with the lawyers to ensure that the details of the settlement were still being followed, which I genuinely think they were, and it emphasized that we knew who the Title IX coordinator was if any issues arose. But otherwise it never really crossed my mind. I do want to say that I do not feel that there were any negative repercussions towards the team because of the lawsuit, which says a lot about Quinnipiac. I think in some places a lawsuit like this could create a lot of tension between the volleyball team and other coaches, admin, etc. but I never heard anyone talking poorly about the lawsuit or the settlement requirements. Maybe because in the end it kind of benefited all athletes? Still impressive. JF: How can you say athletics has shaped you to become who you are today? EK: Athletics has forced me to have relationships with so many different people. I think that is what I am most thankful for. The people you meet in athletic environments are so driven and brilliant in their own inspiring ways, you can’t help but take a little piece of each person with you when you move on. Athletics has also forced me out of my comfort zone and I don’t think anything else could have done that to that extent. I would have never moved across the country twice if it weren’t for athletics. But I did, and I learned and experienced so much good and bad from it! And to reemphasize, I met so many great people! I look back and cannot believe the amazing people I would have never known. I still keep in contact with so many people that athletics connected me with- way more than people I met outside of athletics. So yeah, so thankful for the special people that have shaped me into me, and thankful for athletics for bringing us together! JF: All things considered, the Title IX case came out in a very positive direction for the volleyball program. Looking back, would you change how it all went down or would you keep it the same? EK: Because so much of the lawsuit/settlement had been taken care of before I got to Quinnipiac, I wasn’t really in the “hot seat” of it. I just happened to benefit from it. BUT I am so appreciative of and inspired by those that were involved throughout the whole process. Having the courage to take on an entire University for something as controversial as Title IX is so impressive to me. Plus, they had to know that the entire process would take so long that it was unlikely that they would even benefit from the settlements (if they won). What an awesome group of females that stood up for the girls that would be following in their footsteps, again, the people! JF: Other athletes must look up to you for the path you forged. What do you say to young girls everywhere trying to live their academic and athletic dream? EK: I think being involved in athletics at any level is such an awesome opportunity. You don’t have to be the best player to reap the rewards athletics offers. Be a good teammate, and have a positive impact on those around you. Those are the people that make it big in life. No one is going to look up your stats once it’s over, trust me. And it is hard to practice those skills outside of athletics, so stick with it. JF: Being a former athlete at this school, was there ever a time you thought female athletics were treated less than men’s? Jessica Bracamonte: In terms of equipment, supplies, training facilities, and coaching/support staff I believe that both the women’s and men’s team were treated equally. Typically, we trained on the same fields and lifted in the same weight rooms. We all received apparel and all equipment necessary to play the sport. The only aspect in which I would have considered the women’s team to have been treated less than men’s would be the popularity and fan base at the games. There is always a larger fan base and turn out for men’s athletics than at female’s. It’s sad because female athletes are truly exceptional and very fun to watch. Jessica Bracamonte signing her letter of intent to play for Quinnipiac University. JF: How well were you made aware of the Title IX lawsuit QU went through just a couple years before you arrived to play on campus? JB: I was not aware of the Title IX lawsuit QU went through until Junior year when I was joining the club lacrosse team. They informed me that the team was not affiliated with Quinnipiac as a result of the lawsuit. JF: Do you know what Title IX is, what it does, and who it protects? JB: I believe Title IX is used to protect groups of people against inequality in sports? For example, it ensures that a female athletic team receives the same support, gear, and budget as a male athletic team. Beyond that I’m not that sure. I know they educated us on it while I was playing. JF: What do you tell girls who are trying to move on in their careers and play college sports? JB: You have to have strong time management skills. Be prepared to sacrifice a lot of social events and late night hang outs. Also be prepared to meet your best friends, have the time of your life, and work harder than you ever have. It’s beautiful to have a whole team of people you can rely on. You just need to be disciplined in both your academics and athletics. I would say follow your heart and trust your gut. You’ll know within a month or two if playing a college sport is what you truly want to be doing. The sport should always be something you love even when it gets hard, if it’s not it might be time to say goodbye to it. JF: Being a female athlete, throughout your entire career did you ever feel like women’s sports have taken a back seat to men’s? Allison Roethke: I have always felt that women’s sports have “sat in the backseat” to men’s. My parents actually had me play boys hockey growing up. They thought that it would be better for my future because of the lack of attention women’s sports was receiving in my town at the time. JF: Female athletes maintain such an inspirational stature in the sports world. When you step on the ice, who would you say you “play for”? AK: It’s so cliche but we all play for the little girl watching us from the stands. We see that little girl and it reminds us of where we started. We want them to see us, and think “Wow, I can do that!”, and they can. We are powerful people in a very important time for women. JF: When you were growing up, was there a big inspiration you had to get you to play sports at the D1 level? AK: My older sister. I always wanted to do everything that she did. She ended up committing to UConn and I ended up following in her footstep out to the east coast to play as well. She always showed me that it’s worth it to try and make a change. JF: QU is set to host the women’s Frozen Four this year. Something that ten years ago during the Title IX case seemed impossible. How proud are you of this establishment and its ability to grow around talented and popular female athletics? AK: I can’t even put into words how incredible it is for Quinnipiac to be hosting the Frozen Four. We have the best of the best facilities and resources. I am proud to be a part of this program and its journey to grow the women’s game. We strive every day to not only be the best hockey players but the best people. From then to now, female athletes have been forced to make a change. Elizabeth Kloos was part of the first group of trailblazers to suit up for the Bobcats. She was part of the first effort to drive Quinnipiac out of the throws of the consent decree. Fast forward two years, and Jessica Bracamonte was made minimally aware of the case as a whole. She didn’t know much about it when we talked, and didn’t really grasp Title IX until she was three years into her college career. There needs to be more education on this topic, and transparency between the university and its athletes. Look at what Allison Roethke said. She sees this university trending in the positive direction, especially with hosting the Frozen Four this year. If the establishment continues to push forward, and make strides for female athletics, it will leave the Title IX case in the dust. However, the women who started it all can’t be overlooked. Because of the strong fight those athletes had, the university has brand new facilities, plenty of trophies and will host a Frozen Four. It is truly a turn of the tide, and should build excitement for Bobcats fans moving forward.